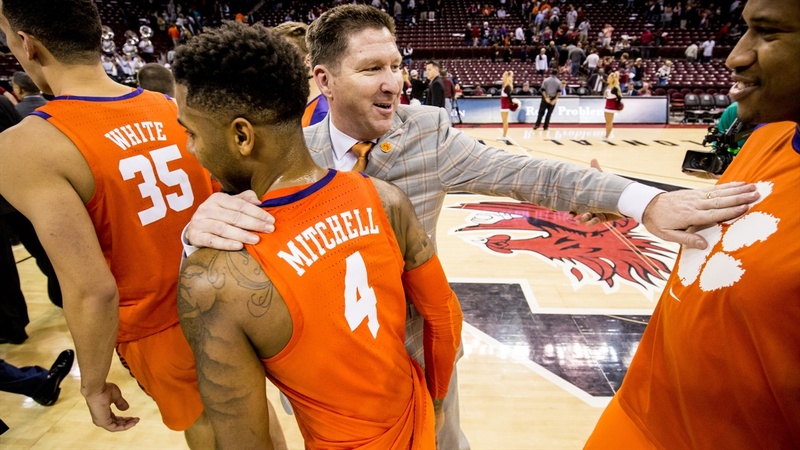 Clemson head coach Brad Brownell sat down with the media the day after the national championship to put a bow on the 2018-19 season. The Tigers, who were led by seniors Marcquise Reed, Elijah Thomas, and Shelton Mitchell, finished 20-14 and had nine wins in ACC play. Brownell: “It wasn’t the season we wanted. We were hoping to make the big tournament. But I’m still proud of what our guys were able to accomplish in terms of 20-win season, nine wins in the ACC. I thought we had some adversity throughout the year. Certainly Shelton Mitchell - I feel bad I didn’t realize how bad his knee was. He had surgery last Thursday. They found a bone chip in there floating around so I know it was very painful for him and he had to overcome a lot throughout the season. The close losses were very challenging for our team… There’s always going to be a lot of close games or games that come down to the last minute, and there are plays that are made. Sometimes you win a game by five or six when really it was closer than that. I don’t know if I have ever been in a season where so many plays in the last five seconds that have really gone against you. It really wasn’t any one thing. It was a lot of little things, challenging things. I felt bad for our players on some of those because I thought some of the situations we did some good things. To have special years, you gotta win those games, and we didn’t do it. And ultimately, that’s my fault. Our guys showed tremendous resiliency. When you get punched in the gut as many times as we did, it’s not easy to always get back up and fight the way that you need to fight in this league to win games. It’s an extremely challenging league, and I thought by, and large our guys did a great job of that. I give our seniors a lot of credit for continuing to push through adversity. I just wasn’t quite where we wanted it to end up. Now we’ll move forward - certainly wish our seniors well. Those guys had tremendous careers and gave our program a lot. Now there’s going to be a great opportunity for some younger guys to not only get to play but become primary players. -- Was asked about the state of the program and how Brownell feels about what he’s bringing in next year - said there was negativity in the question. “I know it looks like we’re losing some great players and the other guys are all unproven so now it’s like, ‘oh wow, the state of the program is -’ I think there’s some negativity in that question, to be honest with you. I think the program is fine. I think it’s hard to be really good every year. If you really want to know the truth, if you look at the history of basketball at a lot of schools, there are very few programs that are really good every season and built to win 20 games every season. It’s hard. Having said that, I am not putting a limit on our team. I have a lot of confidence in the guys we have. I have a lot of confidence in our coaching staff. I like the guys we’re bringing in. We’re working really hard to add a couple more pieces. I think our program is in a really good situation. Our guys graduate, we do things the right way, we’re coming off two straight 20-win seasons. I guess a part of that question frustrates me because you aren’t looking holistically about everything that’s going on. “It’s a process. Those guys are in the process of becoming good players, and I thought Clyde made a nice jump. Aamir Simms made a jump. I’d love for those jumps to be higher and faster, but I think one thing is Marquise Reed took 15 shots per game… If you look at my play card - Marquise Reed, Elijah Thomas - there was probably 15 plays for each of those guys. You’re going to play through your best players. My point to that is that means there are not a lot of plays on that card for Clyde Trapp, Aamir Simms or anybody else. Part of it is just opportunity. Somebody is getting 15 shots. They gotta go to somebody. Whether Clyde gets eight of those or 10 of those or a grad transfer gets five of those or ten of those remains to be seen, but somebody is going to get them. I think sometimes I think we all look at when you lose really good players there are chances for guys to step into those holes it’s just all based on opportunity. You gotta be a good player. It’s not easy to do what Marcquise Reed did. It’s hard to consistently score like he did, but we are going to have to play a little differently. “We’ve got spaces. We still got at least three scholarships right now. We knew we were going to have some and that’s fine. We’ve planned on signing some older players and are recruiting some fifth-year guys. Said Texas Tech was a primary example of that - they brought in two fifth-years who were key contributors to their team. “It was a little bit of a surprise, don’t know about a total shock. Hate to see him go because I think he is a great kid and I think he had a chance to help our team next year. I think he wanted to play more. I’m not going to promise him that he was starting or any of those kinds of things. That wouldn’t be fair to other guys on our team. Sat him down and explained that there was a lot of minutes available with Elijah Thomas leaving. “It just makes you think about how you want your roster to be and sometimes you can predict things and sometimes you can’t. Obviously, we didn’t think that Javon would leave. The climate now is such that you probably should be predicting that people will leave. It’s a natural thing that now happens… When I was a young coach, it used to really bother me. It doesn’t really bother me as much anymore now when people leave. Sometimes it’s better when people leave for both parties. Sometimes there are better avenues other places, and it doesn’t mean that it’s negative. It’s not just in basketball, it’s all sports. Said high school kid’s recruitment takes almost two years, but sometimes you can get a great player and recruit him for two weeks. It saves time, money, and headaches. Coaches are starting to just recruit transfers. Those scenarios are quicker and easier. -- Said he was scheduled to have his annual end-of-the-year meeting with Athletic Director Dan Radakovich later in the day.